Two invites the audience into a North England pub, wherein the struggles and joys of coupledom are on display. What Did You Think Of Two? Written by Jim Cartwright, Two is about, as its title suggests, couples. 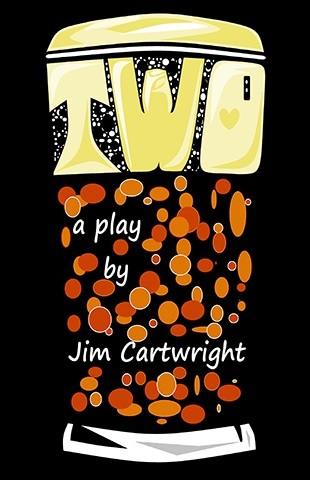 Set in a pub in the North of England, the play revolves around the husband and wife duo who own the pub. This pair is your quintessential quirky couple – always bickering, rolling their eyes behind the other’s back and poking fun at each other. But beneath these seemingly playful interactions are very real grievances that aren’t revealed until the very end, when the tension develops into a rather melodramatic reveal of hidden truths and suppressed emotions. The development of the main storyline is broken up by a number of vignettes as local patrons visit the pub, each coupled in their own way. For instance, we have the old woman in for her daily drink; she doesn’t get out much, having to care for her crippled husband. And the young woman who is completely dissatisfied with her vertically challenged partner. These vignettes had the potential to take the audience on an emotional journey. There’s the heartwrenching tale of a widowed husband, the shocking portrayal of an abusive relationship, the delightful banter of an old couple. Although ripe with potential, none of these slice-of-life stories engaged me the way I’d expect and added little to the overarching story involving the pub owners. While the content did little to inspire me, I do have to give credit to the performances. Under the direction of John P. Kelly, Michelle LeBlanc and Richard Gélinas competently portrayed an array of characters. They made great use of physical characteristics and body language to quickly give the audience a feel for each character and make them distinct from each other. It was an impressive feat handled with grace and skill. I also enjoyed the bits of audience interplay that occurred throughout. The set, which consisted of a bar, included tables and chairs that were occupied by actual audience members. It was a nice touch and helped close the gap between audience and actors, creating a pub-like atmosphere entirely appropriate given the setting of the play. Although underwhelmed by the content of the play, the actors managed to keep me engaged, and I left feeling impressed by their talent. But that’s just my opinion and I’d love to know what you think. Did you find the content engaging? Were you impressed by the acting? Let us know in the comments section below!